The day will feature family-friendly entertainment, free food and giveaways. 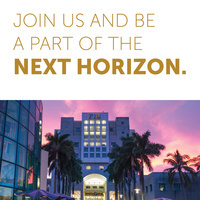 Highlights include a presentation about the campaign by President Mark B. Rosenberg, an exclusive first look at the Next Horizon video and a reading by alumnus Richard Blanco, who wrote a special poem for FIU inspired by the Next Horizon Campaign. There are also live performances by alumnus Tony Succar and the Mixtura Band and DJ M Dot, as well as interactive exhibits of FIU research, community programs, and more. Do we have to stay until 5 pm to get the 3 points for the honors college? Also, will there be a sign in sheet for honors students? Juan - yes, this is a family-friendly event! I’d love to see the girls! Are we able to bring our kids? Carolina - The Next Horizon campaign focuses on two pillars – student success and research preeminence – we want to increase scholarships and student support; optimize teaching; and accelerate research and discoveries!